Well hello! Have you had the opportunity to pour over the new Occasions catalog? If you haven’t, you have no idea what you’re missing! I have to tell you, I am in L-O-V-E with this catalog! Could it have something to do with Valentine’s? Maybe? But, I really think it’s just because everything is a “must have” in my opinion! OMG! Check out this card I made using the Rose Garden Thinlits and the “Foxy Oxi” technique (uses Oxiclean). It’s so pretty and so elegant; I wish you could see the shimmer of the rose from the clear Wink of Stella. Do you want to know the BEST part of all? The Rose Garden Thinlits are a part of a bundle! Yes, a bundle that will save you 15%! Now, who doesn’t like to save money? “I don’t” said no crafter EVER! 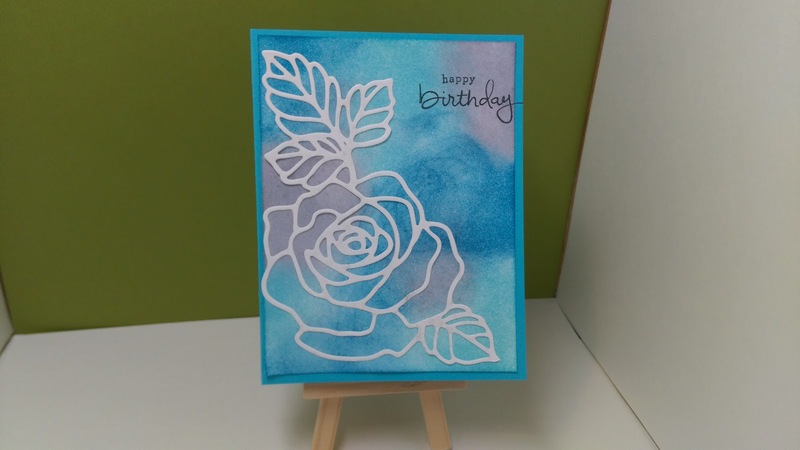 I will tell you, this set of Thinlits is very intricate and I do suggest you use it with the Precision Base Plate and the Big Shot Die Brush, also found in the Occasions catalog on page 19. They will ensure not only a perfect cut but an easy removal of the design from the die without having to sit and poke out each and every hole in the die with a “pokey” tool, you know, the paper piercer. See you Saturday and Happy Stamping!